The Oceanvolt system is currently offered on the USA built J/88, and starting this fall (2017 model year), will also be offered on the J/95, J/97E, J/112E and J/122E). Imagine sailing on a beautiful day knowing that, even if the wind dies and you’re forced to turn on the motor, peace and tranquility are not lost. 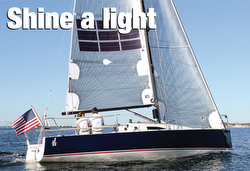 Every minute sailing, the battery pack is being charged, allowing you to later silently power back to the harbor. “There is no quicker way to break the magic and silence of a beautiful day for sailors than having to turn on the diesel engine,” says Jeff Johnstone, President of J/Boats. Oceanvolt electric motor systems are standard on more than 45 boat models, both monohull & multihull, represented by 30 different boat manufacturers worldwide. The systems are highly reliable, silent, maintenance free & create energy while sailing, even with folding propellers. The batteries of the propulsion system can be charged using the hydro generation feature on the motors, solar power, shore power or a small DC generator. The generation feature creates hardly any drag, only 0-0,5 knots depending on the speed. The Oceanvolt refit attachment flange has been designed for easy installations to fit directly onto existing sail drive beds of Yanmar and Volvo motors, so it is possible to install it into your existing J/Boats model as well. In addition to sail drive motors (up to 45hp) Oceanvolt also offers shaft drive models that are compatible to motors up to 25hp. Because the systems are 48V they are safe and can be installed without any special certification. Contact salesusa@oceanvolt.com for more details about refitting. Learn more about the J/88 Oceanvolt model. And contact J/Boats to get more information about the different electric motor packages on the new J/Boats. The crew of Quantum Racing's J/88, Deviation, weighs in on some dos and don'ts for getting your boat up to speed and off the line. Deviation at Key West Race Week. In large fleets, starts can make or break a race, so make sure when you line up for go, you know exactly where you want to be, and how to get your boat moving afterwards. Remember these key aspects of every start and you'll get off the line every time! There is a key dynamic between the skipper and the mainsail trimmer. The mainsail trimmer has to be on the ball. They are key to getting the boat up to speed, and when to trim to get the boat to point. If the boat is going slow and you over trim the main for height you can suffer and never get the performance you are looking for. In short, you need boat speed first and pointing ability second. The other key is that the mainsail trimmer steers the boat as much if not more than the skipper. If the mainsail trimmer is slow on adjustments, then performance suffers. The mainsail trimmer needs to have a good handle on boat speed and angle. They have to know when to sheet harder to get the boat to point and when to ease and get the boat up to top speed. Also, the mainsail trimmer has to use all the tools in order to get the most out of the boat. Adjusting backstay, using the traveler, setting the vang and Cunningham are all important ingredients to proper main trim and performance. Finally, the main trimmer needs to be proactive as opposed to reactive. By being proactive, they need to coach the skipper and the boat. They need to adjust quickly to changes and be able to get the best possible performance out of your sail plan and boat. After each regatta, look back at the overall team performance and note what the team did well and any areas that need improvement. Keep practicing and your team will see the results. Deviation finished 2nd in the J/88 class at the 2016 Quantum Key West Race Week. (Boston, MA)- Get out of the frigid weather and enjoy the warm and friendly environment of the Boston Convention Center, home of the New England Boat Show. The show continues from February 13th to 21st! 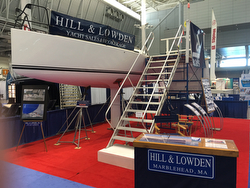 The J/88 family speedster is sitting pretty at her stand #1328, courtesy of Hill & Lowden in Boston, MA. To make an appointment, please contact George Lowden at ph# 781-631-3313 or email- HillLowden@aol.com. For more New England Boat Show information. Watch this “home-brew” by Bill Heintz of a variety of drone videos and stills from many of the famous photographers at Quantum Key West Race Week- nicely done! Watch this sailing video to learn more about the ideas and concepts behind the J/88 Oceanvolt option and how J/Boats pioneered the world’s first “solar sailer” keelboat- a boat that can run all day long on just solar energy! El J88 es, sin duda, una excelente propuesta para aquellos que conocen y han navegado el archifamoso J80. Un day cruiser con unas líneas algo diferentes y unos centímetros de más, que hará las delicias de quienes deseen tener un crucero-regata de nivel de medidas contenidas. La conocida marca J Boats se creó en Estados unidos en 1977 de la mano de los hermanos Johnstone con el J-24. Desde entonces se ha consolidado en la creación de barcos excepcionalmente rápidos, muy marineros y de muy alta calidad constructiva. Desde 1994 el astillero J Composites, en Les Sables d’Olonne, Francia, ha construido los veleros J para Europa, ganándose un gran fama en los barcos denominados crucero-regata y en los monotipos, especialmente en el J80 del que ha derivado el J88 del cual hablamos aquí. En España la marca la importa y distribuye Nautamarine desde Rosas en Girona. In the past sailors have taken the ecological high ground over other boaters, yet modern sailing requires far more electrical power than it used to. With new onboard technologies and their growing demands for power, it’s clear that sailors now experience regular energy shortages while cruising and/or racing, even over relatively short distances. And of course, the problem grows exponentially when you are racing across oceans and around the world. Sea and sun go hand in hand, so solar power has long seemed to offer an answer to this problem. However, rigid solar panels are heavy, bulky and require a lot of ingenuity to install discretely; but what about producing electricity with our sails? See the article attached here- thanks to SEAHORSE magazine. In the past sailors have taken the ecological high ground over other boaters, yet modern sailing requires far more electrical power than it used to. With new onboard technologies and their growing demands for power, it’s clear that sailors now experience regular energy shortages while cruising and/or racing, even over relatively short distances. And of course the problem grows exponentially when you are racing across oceans and around the world. Sea and sun go hand in hand, so solar power has long seemed to offer an answer to this problem. However, rigid solar panels are heavy, bulky and require a lot of ingenuity to install discretely; but what about producing electricity with our sails? Sails offer the largest available surfaces on a sailboat which makes them the most logical place to collect solar power. But if this has not been done before, then there must have been good reason. Key West, FL (January 17, 2016) – One design sailing forms the backbone of the racing fleet at Quantum Key West Race Week 2016: out of the 133 entries from 16 countries lined up now to start racing on Monday, over 70% are competing in five classes at this event. Among racing purists many prefer one design sailing because the boats are all the same and it’s therefore superior sail trim, teamwork and tactics that win each race. Many one design sailors at Quantum Key West Race Week are repeat customers, having had numerous years of prior experience coming to this unique mid-winter venue, and all look forward to another great week of racing being held over Monday-Friday, January 17-22nd. 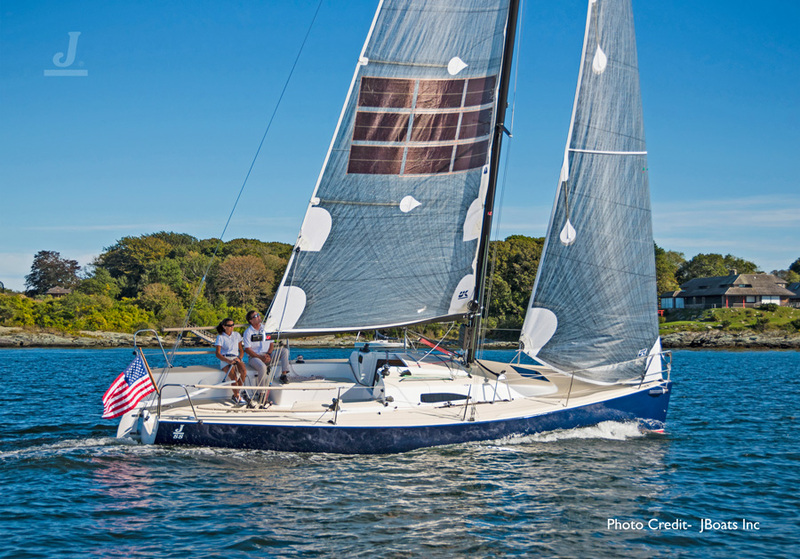 Rounding out the one-design classes at this year’s regatta is the J/88 Class, who with 8 entries hailing from the US and Canada are racing among the ORC 1 and ORC 2 classes on the Division 3 course area to the southeast of the island, with Storm Trysail’s Wayne Bretsch as acting PRO. In this class Rob Butler (Collingwood, ONT) is the defending champion on his Touch2Play Racing, earned last year in a tie-break by winning the last three races to overtake Iris Vogel (New Rochelle, NY) and her crew on Deviation at Quantum Key West 2015. Deviation is back to make a run at Touch2Play while Butler believes a pair of newcomers – Blondie 2, co-skippered by Jeff Johnstone and Tod Patton from Newport, RI and a smaller Spaceman Spiff sailed by Ryan Ruhlman from Bratenahl, OH – may also provide stiff competition in the class. “Key West is always a blast. You can count on great breeze and awesome weather. It’s just a great way to start off the New Year,” said Butler, who keeps his J/88 at his winter home in Naples, Florida. (Cartagena, Columbia)- J/88 eye-candy anchored off Columbia- South America!? 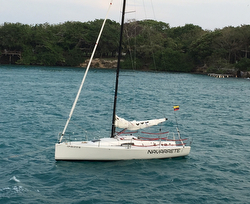 Yes, this is the first time ever that a J/88 has sailed from Cartagena to the Rosario Islands, 23 nm southwest along the Caribbean coastline from the magnificent mountain/beach resort of Cartagena. 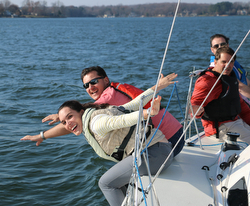 (Lake Norman, NC)- John Killeen reports that, “since last Spring we have been in the process of developing a sailing school and working very closely with the Peninsula Yacht Club on Lake Norman to grow sailing at their club. As you know we delivered J/88 hull# 64 to Brian O’Malay who is a member there and because we have that boat available at the club we've been able to sell another J/88. So, our expectations for 2016 are high! Key West Highlight- J/88 Oceanvolt Racing O.D.! (Key West, FL)- The 2016 Quantum Key West Race Week is shaping up to be one of the largest in recent years. Under the new stewardship of Storm Trysail Club and Regatta Chairman Bill Canfield, the event has 140 boats registered with 78 J/Teams (56% of the fleet!) spread across three one-design classes (J/70, J/88, J/111) and three handicap classes (IRC & ORR). Racing is taking place from January 18th to 22nd in the gorgeous aquamarine waters of the Florida Keys. One of the highlights for the week will be the inaugural J/88 Midwinter Championship with eight boats participating on the Division 3 course area. Featured amongst that enthusiastic fleet will be the Key West debut of the new J/88 Oceanvolt model. Called BLONDIE 2, she will be sailed by Tod Patton and Jeff Johnstone. They will be facing a rogue’s gallery of top teams from Canada, San Francisco, New York and Ohio. The other significant one-design class debut will be the nine J/111s sailing their first J/111 Midwinter Championship on the Division I course area. More news on all J/Teams and classes in next week’s Key West preview.